This two-for-one recipe yields a second dinner with a minimum of extra time and ingredients. Serve the roasted root vegetable casserole on the first night. 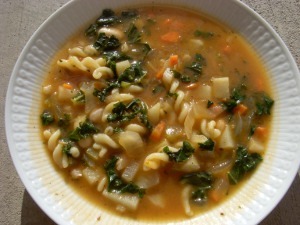 On the second night, place the leftovers in a big soup pot, add a couple items, and enjoy a tasty dinner stew. Preheat oven to 350°. Peel all vegetables (you can scrub potatoes and leave skins on), cut into 1-inch cubes, and place in a large roasting pan. Drizzle olive oil and sprinkle spices over veggies and mix well. Add 1/2 cup water to roasting pan. Bake for 1 hour uncovered, then cover and bake for an additional hour. Serve with a colorful salad and a crusty loaf of bread; sit back and enjoy the compliments! In a large soup pot, put leftover roasted veggies, a 10-oz package frozen cut green beans, and a quart of vegetable broth. Add just enough water to cover vegetables. Bring to a boil; reduce heat and simmer for 30 minutes.